Keep yourself protected from the elements all year round with the VX-3 Novus Youth FZ Jacket. Made by VX-3 with a durable rip-stop outer, whether on the training field, the high street or commuting to and from training, you can be assured of protection from showers and the wind. 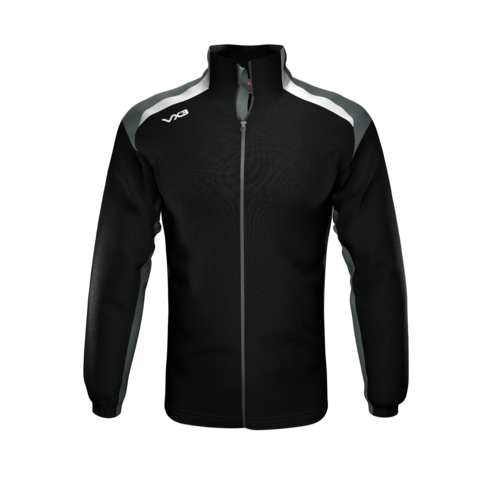 This full zip jacket has been ergonomically shaped to improve the fit which keeps you comfortable when taking part in various activities, the warm mesh lining also insulates you the best it can whilst a concealed hood is waiting to be pulled out from the collar. Sporting a black look with dark grey and white panels upon the shoulders, the VX-3 logo appears on the right shoulder and back of the collar.